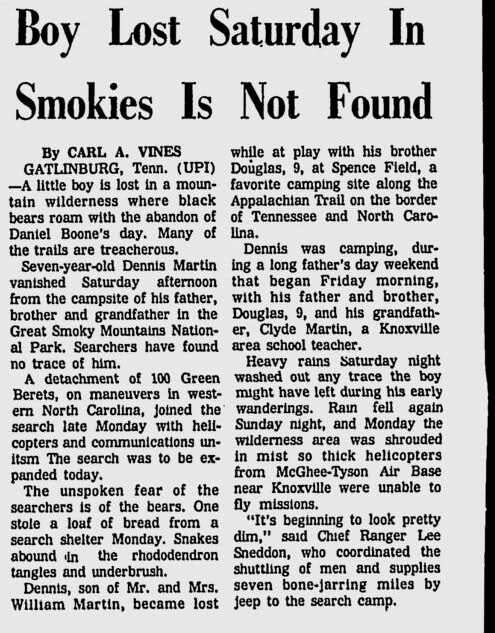 It was Father’s Day weekend, 1969, when William Martin, his sons Dennis and Douglas, and his father left their homes in Knoxville, Tennessee and headed to the Great Smoky Mountains for a weekend camping trip. 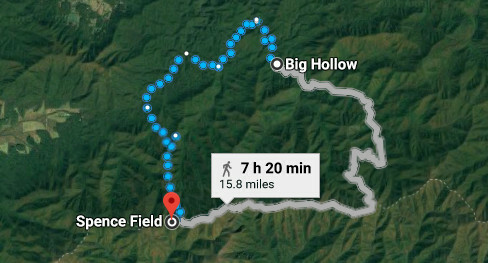 They hiked from Cades Cove to Russell Field, which is around 10 miles, and would normally take a bit over 4 hours to walk. 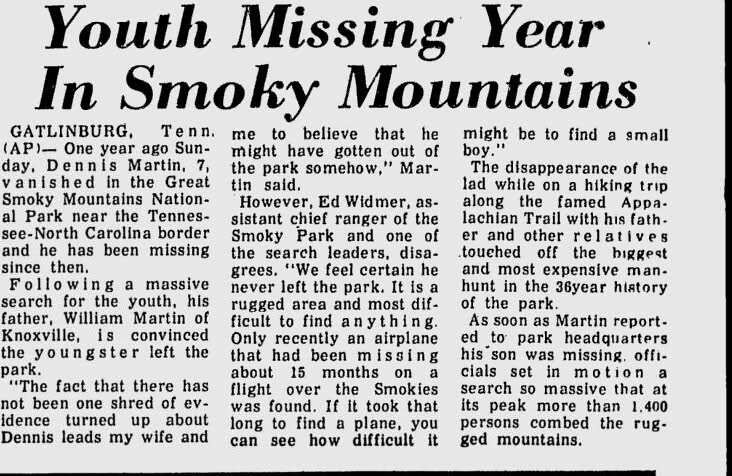 I’d probably think it would have taken the Martin’s a little longer since they were hiking with 2 children. Once they reached Russell Field they decided to camp for the night. 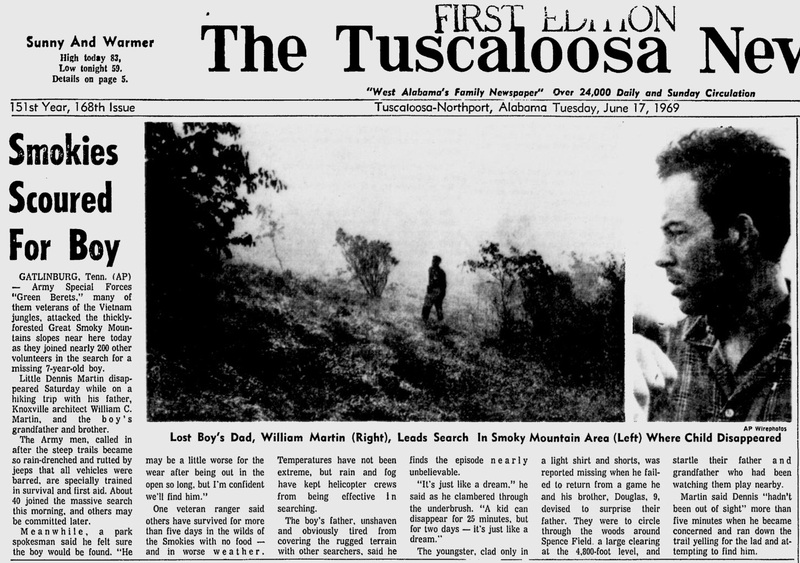 The next morning they would hike to Spence Field, where they intended to spend another night. That trek was considerably shorter than the one from the previous day, so when they reached their destination the boys had time to play. Dennis, Douglas, and some other children were busy romping around Spence Field when they decided to play hide and seek. Unfortunately, this would be the last time anyone would ever see Dennis. At around 4:30 pm he and the other boys developed a plan to scare the adults in the group. 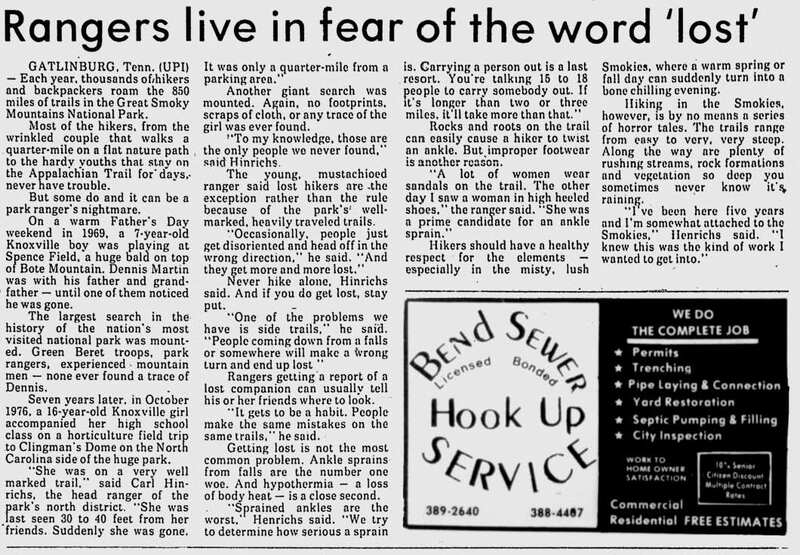 Two would sneak around the trail from one direction, while Dennis would sneak up from another since he was wearing a red shirt and they thought it would be a dead giveaway to their plan. They walked away from one another and that was the last time anyone saw Dennis. Once his family came to the realization that Dennis wasn’t there, they immediately began searching the area for him. Soon after the Park Rangers were made aware of the missing 6-year-old and it didn’t take long for the families plight to reach multitudes. 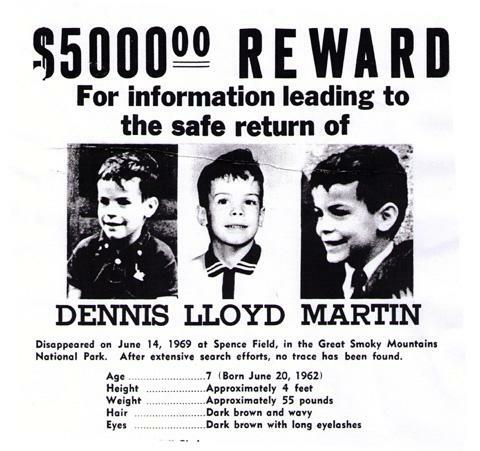 There were over 1400 people involved in the search for Dennis, and when I say search I mean this was the largest, most extensive search in the history of the park. However, as wonderful as it was to have so many willing volunteers, I hate thinking about how much evidence could have been obscured by their efforts. Later in the evening, heavy rains moved in, hampering the search efforts even more. It actually seemed as though every time a search would begin, the weather would intervene. Heavy fog made aerial searches nearly impossible, and rain muddied the ground, washing away who knows what kind of valuable evidence. 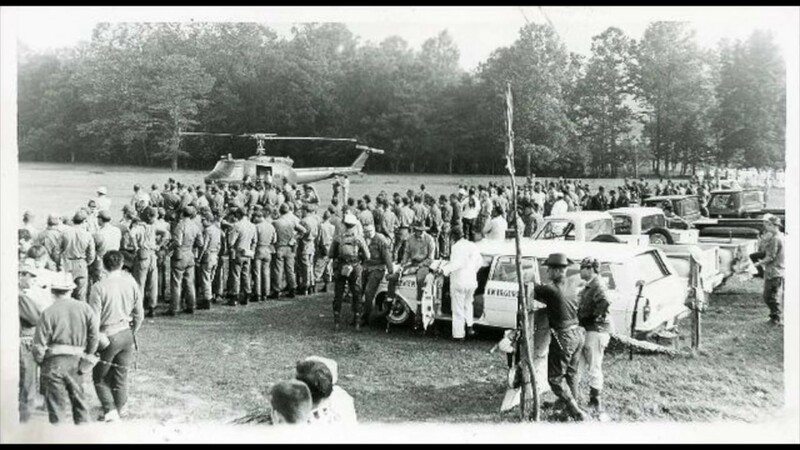 After the initial searches were finished without luck, several other searches were launched, one by the Special Forces and one by the National Guard. At one point footprints were found but they were dismissed as belonging to Dennis. Personal and Government entities continued searching until June 29, 1969, but the search was officially called off on September 14, 1969. His parents maintain hope that he made it out of the park, thinking that if he hadn’t there would have at least something of Dennis’s recovered by now. 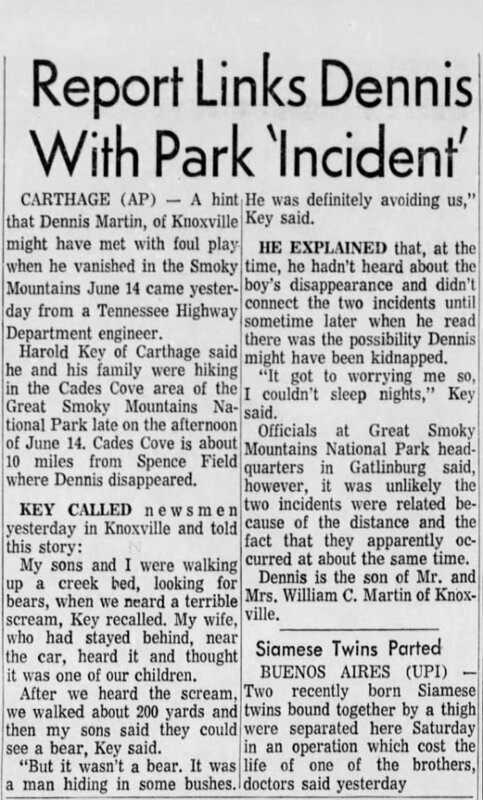 One of the park visitors, Harold Key, did report that he heard a loud scream around the time that Dennis went missing. He then went on to say he saw a ‘rough looking’ man walking through the woods. A lot of conspiracy theories have evolved around that statement…because obviously, a Sasquatch kidnapped Dennis and then the government covered it up. You can actually read a really good write up about Dennis on Crimeblogger’s site. Anyhow, the FBI never was able to find any connection with the scream and Dennis’s disappearance, because of the time the scream was heard and the distance away that Harold was at the time Dennis vanished. With that being said, there was no further evidence to suggest that Dennis had been abducted and removed from the park. In 1985 a ginseng hunter came forward saying that he had found what he thought were the scattered skeletal remains of a small child in Tremont’s Big Hollow, TN. It looks like a long way for a child as young as Dennis, but if you remember the day before he and his family had hiked around 10 miles. It isn’t impossible to think that over the course of a few days he could have made it over the hills and to the spot the ginseng hunter allegedly found skeletal remains. That being said, the man had waited for YEARS before coming forward. Sadly, from the time that the man found the remains several years had passed, giving animals and weather time to disperse whatever was there. Law enforcement went back to the location that the hunter told them about but couldn’t find anything. Law enforcement believes that Dennis wandered off and eventually passed in the woods. Unfortunately, there isn’t any evidence to really suggest anything else. So in the light of what evidence is available, I believe that the ginseng hunter more than likely found Dennis’s remains. It’s just a shame that he waited for so long before coming forward. That decision may have cost the Martin family a chance to finally lay their son to rest.